Last night I received an email from a client with a little blind Poodle. It wasn’t a long email and I have included it for your perusal, but it meant so much to both me and the sitter who cared for him that it prompted me to include it in my blog. When Nina’s Nannies for Pets was formed, it was done through love – a love of animals that I believe was inherent from birth. I have always found it easy to connect with animals, who were my constant companions as a child. Being an animal lover inevitably drew me to the veterinary profession which soon became a long held dream. I was going to save every poorly pet on my planet and help rescue and re-home every orphan! I felt sure that all I required to become a successful Veterinarian was love, but I was soon to discover that I could not actually handle the not so pretty side of this profession, which was euthanasia and not forgetting that I was never really academically minded, or able to achieve the required qualifications. When I left school at the age of fifteen, I decided to follow in my beloved dad’s footsteps and join the family painting and decorating business. For a young female donning a pair of white overalls and venturing up a ladder to paint the outside of a house, was still a source of amusement in a largely male dominated world and yes I did look for the left handed screw driver and the tub of elbow grease, much to my workmates amusement. I did not however, fall for my boss’s insistence that the woodchip wallpaper I had just spent an afternoon hanging, was upside down! When I left the building trade, I spent several years doing secretarial work and a further six manning a switchboard, before my life was to change dramatically. My husband was diagnosed with Multiple Sclerosis when he was just forty two years old, but his determination and zest for life was unwavering and undoubtedly helped my recovery when fate was to strike once again six months later when I suffered a brain hemorrhage. Without going into detail, it made me even more determined to attain my dream of working with animals. Being away from the office made me realize how stressful and unhealthy it was and just how much I hated the work and so my venture into the world of pet sitting began. After thoroughly researching the American pet care industry (it was largely unknown in the UK at that time), I decided that this would finally realize my dream of working with animals. 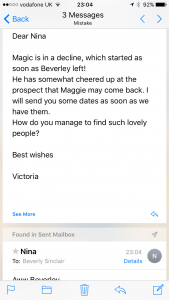 Meanwhile the phone is left unanswered since I am spending a considerable amount of time trying to help re-home a client’s dog whose owner is emigrating to Australia! When I have finally secured a place with a local rescue centre, it is time to address Mrs Smith’s SOS. Her niece can no longer care for her hamster, three chickens, and her three legged pooch and she is flying out to Italy the following day! I explain that a preliminary visit must be undertaken before an assignment is accepted, but she insists that she is so desperate she will accept anyone! After almost half an hour of explaining our procedure and the benefits of meeting your prospective sitter, she agrees and I replace the receiver only for it to ring again. This call is from a client desperate to excel the virtues of their regular pet sitter and why they must be available for a short notice wedding that is taking place that weekend! 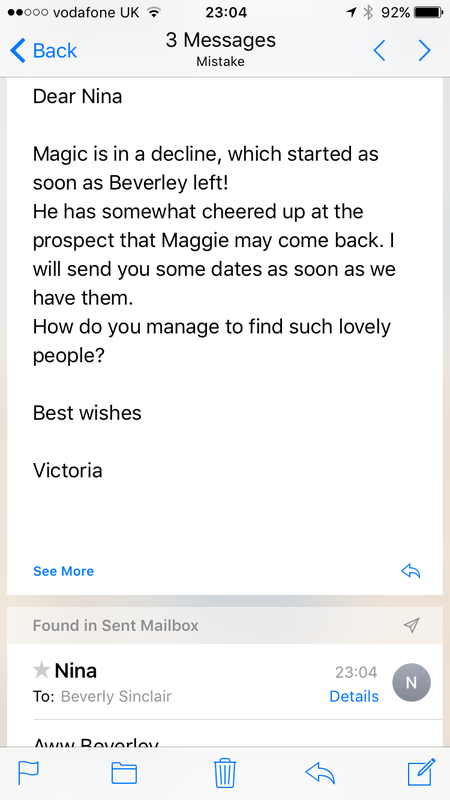 My colleague had spoken to her earlier in the day, to explain that her regular sitter has already been booked, but she is insisting that little Bertie will only accept Susan and after all, she has used our services for over eight years! So yes, I feel that I have realised my dream. I am also extremely thankful that despite my setbacks, I have been able to help educate pet owners, but I will always feel that I could do more! Serious illness does have a massive impact on your life, but for us it has been in a positive way. Last night, when I received that email, I knew that you should never stop trying, to be the best that we can be!